Basic wind transmitter for monitoring tasks. Ideal measuring transducers for basic requirements and appropriate for cost effective solutions. Anemometer KWS 1 for, for example, PCE-WL windlogger. Simple cross-hair anemometer with pulse output and wind direction sensor. Wind measuring device for the measurement of the wind speed and the wind direction of the horizontal air flow. The shutter speed is scanned free of contact and wear and has a particularly light start-up. The wind flap position is detected by resistance. The digital measuring signals from the wind meter can be evaluated directly. - Installation: mast mounting 31 mm drm. The Bluetooth Anemometer PCE-BDA 10 is an optimal measuring device for heating and plant technicians. 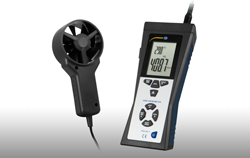 The Bluetooth Anemometer is an easy-to-use meter. The compact vane anemometer PCE-AM 85 is an ideal companion for every outdoor activist. This lightweight vane anemometer with altimeter and barometer function should not be missing on any tour. The vane anemometer PCE-AM 85 informs you about the reached altitude of -2000 ... 9000 m / -6,561 ... 29,527 ft. 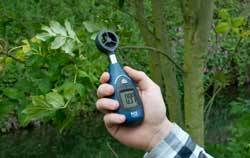 The anemometer PCE-EM 890 is an instrument for measuring environmental conditions. Thus, this anemometer is ideal for technicians, sailors, farmers and many more people who are dependent on the weather or whose activities are significantly influenced by the weather. The anemometer PCE-WSAC 50W is primarily used to measure and monitor the wind load on cranes or wind turbines. 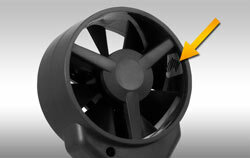 Furthermore, the wind situation can be measured and analyzed before commissioning a wind turbine. The high measuring range of up to 50 m/s of the anemometer means stormy gusts can also be monitored. Compact wind sensor CWG1 for weather monitoring. Basic cup anemometer with 4 … 20 mA output.